Of all of the seals, trumpets and bowls, the fifth seal is the only one that does not cause any wrathful consequence upon the earth or human beings; it is solely a heavenly event concerning Believers as God's plan of judgment unfolds. The apostle John saw the souls of Believers who were martyred because of their faith in and testimony of God during the tribulation. The tribulation saints were comprised of Messianic Jews, Gentile Believers, and new Believers who responded to the evangelism of these saints (Rev 7:9). 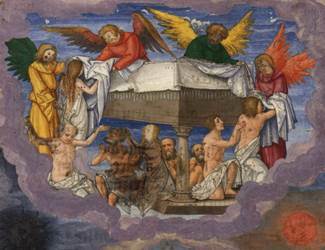 Upon their release from underneath the altar, the martyred souls were given a white robe (Rev 6:11), which represented the righteous acts of the saints (Rev 19:8). This clothing is reminiscent of Jesus' Parable of the Wedding Banquet (Matt 22:1-14), which was worn by the wedding guests. After the gathering of saints (rapture), the wedding banquet actually takes place in heaven; but unlike the parable, the saints represent the bride (Rev 19:7-8)!